Solid Crystal Opal Sterling Silver Ring (Ladies). This ring is much more beautiful than it appears on the pictures! 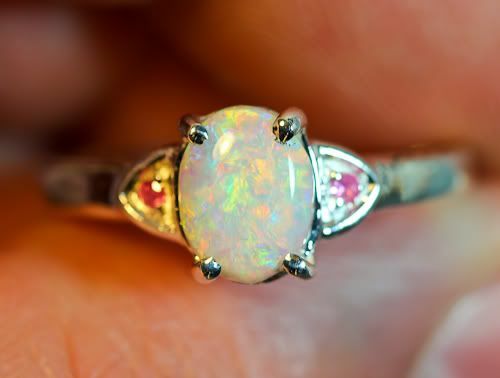 Beautiful, multi-colored solid crystal opal set into a sterling silver ring. 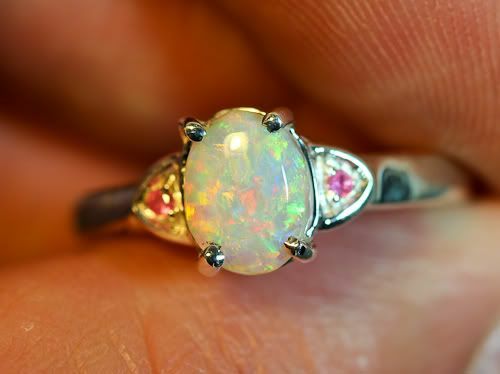 The opal is a 0.90ct amazing solid crystal opal, very bright 4.5 out of 5 in brightness. It's N7 light in body tone! Looks great under any light! Fantastic bright stone! 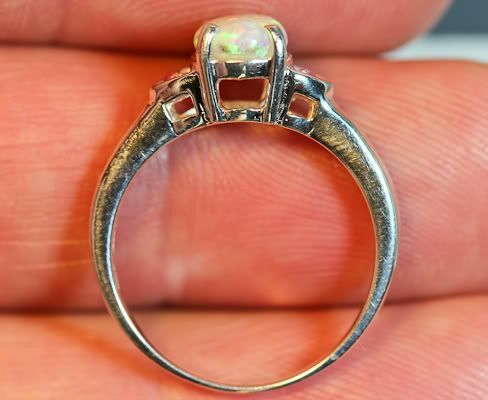 The ring is made from sterling silver, contains two small sapphires from Thailand, it weighs 2.60 grams(with the opal). Very pretty ring! Scroll down to see a video of this ring!! 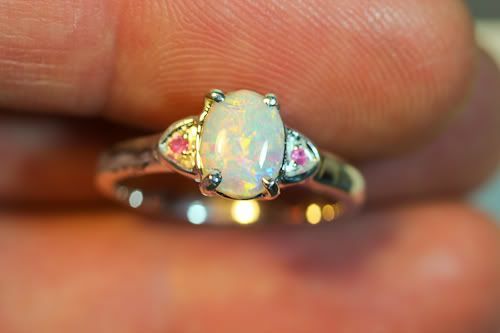 This opal ring is absolutely beautiful. I only sell solid(natural) black and crystal opals from Lightning Ridge. * Body tone is N7 Light (Translucent). * Brightness is 4.5 out of 5. * Thickness of the stone is 3 mm. Medium dome. * The weight of the stone is 0.90 ct.
* Retail value is $500. 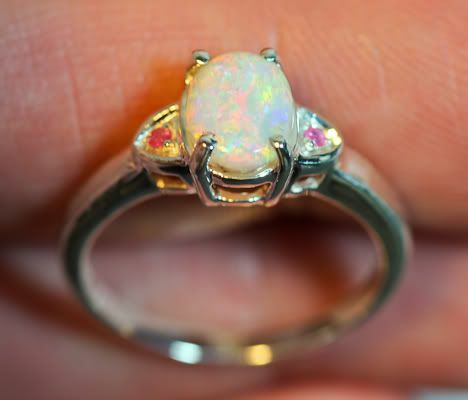 Don't miss out on this truly beautiful solid crystal opal ring! BUY WITH CONFIDENCE! I HAVE 100% POSITIVE FEEDBACK RATING. I am an honest seller. Just read my feedbacks. I combine shipping for multiple winnings pay only $1 for each additional item! 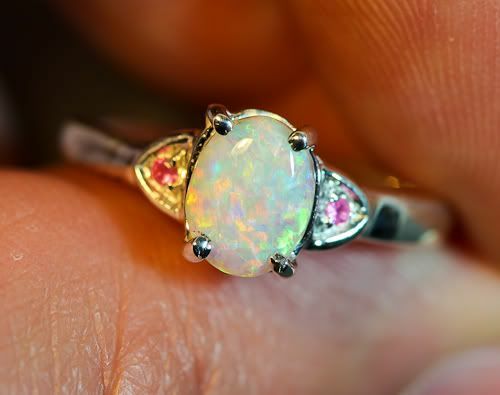 Buying hint: Always read item descriptions of other seller's opals carefully as people call everything Black Opal (including: triplets, doublets, synthetic opals, treated Coober Pedy Matrix Opals etc). Only natural, solid, earth mined Opals can be called Black Opals, the above mentioned types of opals are not Black Opals, they are what they're called. Me and a select few opal sellers on eBay, who are honest, sell the genuine material and are passionate about what we do, get really annoyed by the scores of sellers who mislead the public by selling 'junk' under the term 'Black Opal' and list these items in the same category with natural opals. So, our category (opal, solid) gets cluttered with these listings making it difficult for people to find the genuine items. 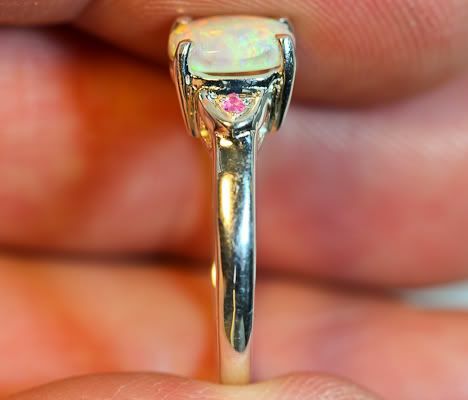 A $30 triplet opal that is called 'black opal' by these sellers is lightyears away in quality and price from a genuine black opal (they can't even be mentioned under the same page), even if the black opal is just a low quality stone.